Tea is one of the most often used and consumed products in the entire world. This leaf, plant, or drink (depending upon your perspective) comes in a tremendous variety of leaves, plants, and other forms. People can choose to drink instant tea, tea concentrate, or even brew their own tea from leaves. Recently, there has been a surge in the popularity of powdered tea. This has led to a number of questions about the differences between powdered tea and tea leaves. Which is better in terms of normal health benefits? There are so many different types of tea that it can boggle the mind. The tea bags that you typically find in a local grocery store are usually leaves that have been chopped up and are then quickly bagged to be brewed later. After use, they are typically discarded. Tea can come from green tea plants, black tea plants, and many more varieties. 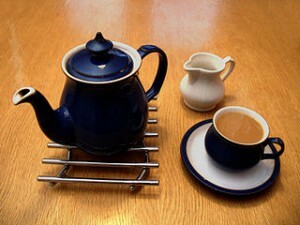 There are also a number of differences in how different types of teas are prepared. In Japan, the leaves or bags are steamed. On the other hand, the Chinese method is to pan fry the leaves and other parts of the plant. Tea powder could really be any type of tea and come from any part of the tea plant. In this situation, the entire plant, and all the leaves and stems are chopped and then ground into a fine powder. Some types of powdered teas undergo a different type of grinding process that incorporates air and causes friction. This results in a tea that is darker and almost cooked. Of course, powdered tea is also packed with powerful anti-oxidants that help to fight off free radicals and help boost the immune system in the process. This formulation is also usually higher in caffeine than loose leaf tea mainly because the user actually consumes the entire leaf (albeit in ground up form) rather than just an infusion from the leaves. This type of tea can also be used in food itself. The powder can be sprinkled into normal foods and there are even specific recipes like making powdered tea flavored ice cream! When using tea leaves, the most common method is by an infusion. In other words, the leaves are steeped in hot water and the resulting liquid is rich in all the catechins and other beneficial ingredients found in the tea. If using the whole leaves rather than ordinary bagged tea, you will find this to be of higher quality. The ultimate question is: which formulation is better? This decision really depends on what you are after. The powdered form wastes nothing, so you receive all the benefits of your tea. On the other hand, tea leaves seem to have a taste which is slightly more pleasant and agreeable to most people. As far as health benefits are concerned, they are both powerful immune boosters and have tons of anti-oxidants. Nootropic Effects: Permanent or Temporary? GABA vs. Phenibut—Which Actually Affects the Body’s GABA More?